10 Bad Habits That You Should Break Immediately! We perform many roles, and do a number of things in life on a daily basis. Many of these things we may not even be aware of, and just end up doing without consciously thinking of them and choosing to do them. Such acts are what we call habits. Though some habits are just a matter of bodily function (like the way we walk or talk), other habits are a result of regular choices that may be either good or bad for you. 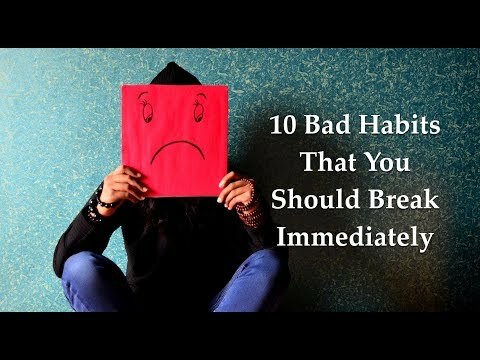 Here is a list of 10 bad habits that you should break immediately if you find yourself indulging in them. Being busy with work and other commitments throughout the day, we tend to try and make time for ourselves after our day’s schedule is completed. However, in the process of trying to enjoy ourselves a bit, we forget the importance of getting a full 6-8 hours of sleep! Staying up late is cutting out from your sleep time, which is bound to make you feel irritable and tired the next day. This vicious cycle cannot be broken unless you get to bed on time and rest well. So fix yourself a bed time, and stick to it. You need your proper rest. If you haven’t had enough rest through the night, you may not feel like getting up when your alarm goes off. But it is important to remember that if you don’t push yourself to wake up at a fixed time every day, your body will only be confused all the time as to whether it should be alert or at rest. And that will decrease your productivity a great deal. So when it is time to wake up, just do it, no matter how tough it is. It will make you so much more disciplined on the whole. Staying in a seated position doesn’t require much energy, and so the body remains almost inactive while doing so. Most of us have jobs that require around 7 to 9 hours of sitting at a desk. So, we start to put on weight and let our health deteriorate without even realizing it. Walking as much as possible to get to work, and getting up from your workstation for a stroll once in a while will keep your mind and body alert, and in good condition. Your nails may just seem like a part of your body that doesn’t need much attention. However, the condition of your nails decides a lot about the overall condition of your health. Your nails, if not well taken care of, may carry germs, which enter the body if you bite your nails or eat with your hands. They are also home to disease causing germs, and allow them to enter and affect your system, which leads to severe illness. So, it is important to stop neglecting your nails, and start taking nail-care a little more seriously. Everyone is busy. But that does not mean that it is okay to skip a meal. Skipping a meal causes the body to feed off your muscle mass for nutrition. This will make you weak and unhealthy in the long run. However, it is also not okay to eat junk just to get something into your stomach at meal time. Eating proper healthy food – at the right time and in the right quantity is the only correct way to care for your body. Alcohol and cigarettes can give you a high, but internally, they destroy your brain and lungs to an almost irreparable extent. Having a drink occasionally is alright, but making it a regular habit is bound to bring you illness sooner or later. Smoking, too, is dangerous as it causes cancer of the lungs, mouth and throat, that are extremely painful and tough to treat. So it is better to stay far from such substances, and choose health and happiness instead. It is a very common habit to just take a painkiller every time we have a headache or feel any other discomfort. However, such self -medication may be dangerous as we do not really know what the cause of the pain or discomfort is. Besides, consuming them on a regular basis will also make your system eventually immune to them, to the point that they will have no effect on your body when they are actually needed and prescribed. Which is why, you should not keep popping pills, but rather, rest, and visit a doctor in the event that you feel ill. The cell phone may be a great device to connect you to your loved ones and keep you updated about things going on in various parts of the world. But just like all other things, it is good only if used within limits. Over using your phone will lead to an addiction that will make you constantly reliant on checking your phone, and can even lead to hyperactivity disorder and a shortened attention span. Therefore, it is better to use your phone wisely so as to get the best out of it, while still retaining the best of your own personality. Clothes are meant to be comfortable so as to allow you to go about your daily activities with ease. Wearing tight clothing, especially tight denims, causes restricted mobility and skin rashes over long periods of wearing them. It may even restrict the normal blood circulation, causing pain and discomfort at the joints. Tight clothing may look fashionable, and make you feel confident. But if it does no good for your health, then it is definitely not worth wearing. We spend money on a daily basis to fulfill our needs and lead a comfortable life. But when is it that we draw the line between spending and overspending? This can be determined only when we plan our finances in advance. Listing out your needs, and accordingly deciding how much money you want to set aside to fulfill them is called budgeting. And if you find yourself spending more than what was planned on those things, or spending on things that you didn’t even plan for, then that is when you know you’re probably over spending. Spending beyond what is necessary may lead to shortage in an emergency situation. It may also lead to debt and later stress to repay the amount. Financial issues have a huge impact on ones peace of mind, and even affect physical health in the process. So, in order to avoid such a scenario, it is best to stop overspending, and keep your finances in check at all times. So now that you are aware of why these habits are bad, maybe it’s time to introspect to find out which ones are a part of your regular life, and make the necessary changes as soon as you can. Facing stress and anxiety in your day to day life simply follow the top 10 tips by WeBeingFit and get rid of all those habits which causing you problems. You will surely notice the change in just a week.